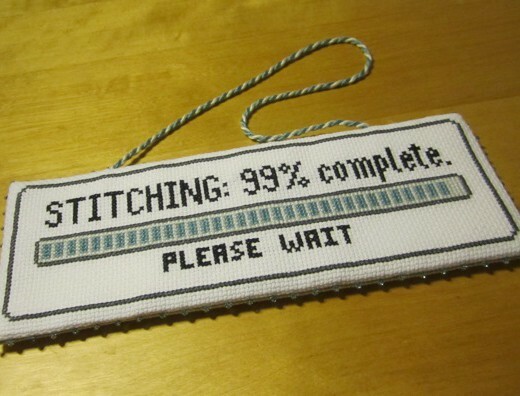 The “Stitching: 99% complete” pattern is the companion piece to “Stitching, Please Wait”. It is the perfect gift for a fellow stitcher. Or do it just for yourself. This piece was designed originally as a gift for a good friend of mine… who also loves stitching! Model Details: Stitched on 14-count white aida, using 2 strands of floss for all stitching. Using blue/gray floss colour scheme. Stitched model was finished as a sign. Perfect for hanging in a craft room. Beads along the edge provide a bit of extra sparkle!